TuneUp Utilities 2014 is a collection of tools for cleaning up, optimising, repairing, customising, and generally getting the maximum possible performance from your PC. The program's core features may seem reasonably familiar. You get tools to clean and defragment your Registry; it can free up valuable disk space by finding and deleting leftover files; and there are modules to control your Startup programs, remove browser history data, defragment your hard drive and more. But what's different here is the attention to detail. When it comes to hard drive cleaning, say, TuneUp Utilities 2014 doesn't just delete your Recycle Bin and Temporary File folders. The suite's Disk Cleaner cleans logs, caches and histories from 28 areas of Windows and more than 150 popular applications, and in the process marginally outpaced CCleaner on our test PC (it found 6,027MB to remove, TuneUp Disk Cleaner located 6,773MB plus 38GB of restore points). It's a similar story when clearing your browser tracks. While other maintenance tools might just wipe your history or temporary files, the Browser Cleaner goes to work on more than 60 areas in IE, Firefox, Chrome, Opera, Safari and more (some of which, like Flash cookies, even the browser may not clean). And this is just the start. Ask most PC cleanup tools to look at your Windows Startup programs, for example, and they'll just list them, leaving you to decide what to keep and what to remove. TuneUp Utilities 2014 will instead examine your current setup and make genuinely intelligent recommendations on how your PC's configuration can be improved: it's like having a Windows expert constantly on hand. The suite also includes lots of functionality which you won't find elsewhere. Like its ability to temporarily disable bulky applications, freeing up valuable system resources without having to uninstall them. Or TuneUp's Live Optimization technology, which intelligently prioritises running processes to deliver the best possible performance at all times. There's also very real depth to the program, with valuable features and functionality everywhere you look. The "Display Processes" tool isn't just some basic list of running programs, for example: it also shows you performance details, the files they have open, any network connections they have open, and more. 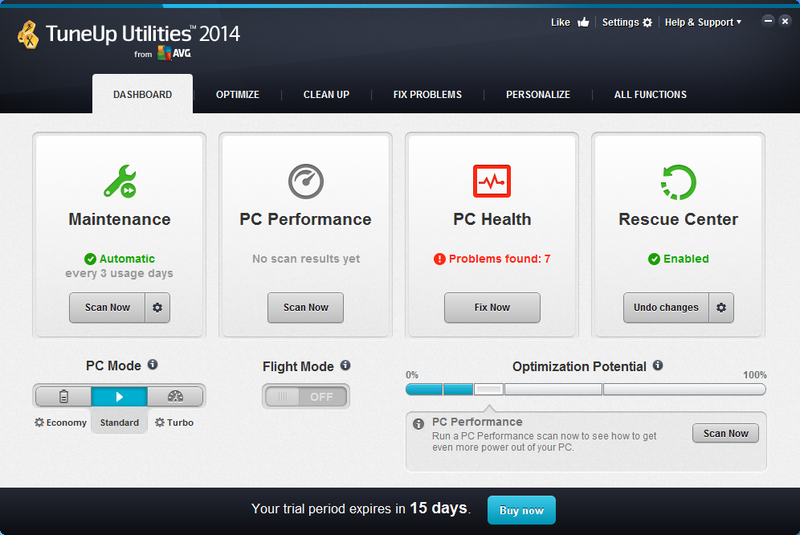 And just in case that's not enough, the 2014 edition has been enhanced with more PC cleanup power. A new Duplicate Finder helps you locate and remove duplicate files which could be wasting your hard drive space. An enhanced Disk Cleaner supports more programs, and is now able to clean up after iTunes, ACDSee, CyberLink Power DVD, Windows 8 apps, and more (150+ applications in total). The new Flight Mode saves even more battery life by turning off Bluetooth and wifi with a single click. And this is all presented in an optimised interface which clearly displays your PC's current status, and makes it easy to find and launch whatever function you need. 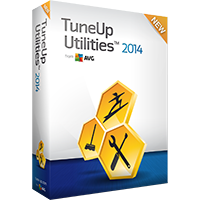 Note that this version of TuneUp Utilities 2014 includes a one PC license, which will never expire. You get a lifetime license which you can use for as long as you want.